Step 1: Determine the rate of oxygen diffusion of the diffuser or air stones used in your system. In this blog we will limit our discussion to 3″ air diffusers, you can easily adapt the example to other sizes using the formula. Step 2: Calculate the amount of oxygen needed for the water in your system in relation to the daily feed rate. Step 3: Determine the number of diffusers or air stones required to achieve the oxygen diffusion rate in step 2. Step 4: Finally, calculate the minimum amount of CFM produce by an air pump that will supply the rate of oxygen diffusion to each air stone at a certain depth. CFM diffuser (ft3/min) = 0.3 cfm (Using our 3″ medium pore SWEETWATER® Air Diffusers from Pentair). SOTE = Standard Oxygen Transfer Efficiency rate (SOTE) or rate at which oxygen will transfer to water under “standard” conditions per 1 foot of depth. For a 3″ medium pore diffuser it is .01 lbs per foot of depth. Depth = 1′ (assuming a standard grow bed of 1 foot depth). Now, let’s calculate the amount of oxygen needed for the water in your system in relation to the daily feed rate. The recommended oxygen to feed ratio from aquaculture literature is given as 1.0 kg of oxygen per 1.0 kg of feed fed[ii]. We will use this ratio to calculate the oxygen requirement of our system. Note: we have seen in practical application especially in smaller systems that half the recommended ratio which would be 0.5 kg oxygen per kg of feed can be adequate. Let’s assume we are growing tilapia in a 650 gallon tank at a final stocking density of 5.5 gallons/lb or 0.2 lb/gallon. The fish consume 2% of their body at the current stage which is about 4.8 lbs (2160 g) of feed per day. Using the 1:1 ratio we need 4.8 lbs (2160 g) of Oxygen every 24 hours or 0.2 lbs of O2 per hour (4.8 lbs/24 hr) which is the oxygen requirement for the complete system per day (or using the 0.5:1 ratio we need 0.1 lbs per hour). Next, we divide the oxygen requirement of the entire system by the oxygen produced by each air stone to determine the number of air stones needed. Since each air stone uses 0.3 cfm, we need an air pump or blower that produces a minimum of 38.6 cfm at 1 ft depth. This size of an air pump will insure that there is more than enough oxygenation occurring in your system even if stocking densities increase. However, in practical application a much smaller blower can used (using the 0.5:1 ratio discussed above, that would give you a 19.3 cfm air blower) but this is a decision to be made by the designer of the system knowing the trade-offs involved. Since this is an aquaponics application, plants in the system may also require oxygen. Additionally, in a RAS system, there may be other components that require oxygen. You must take other significant loads into consideration when sizing your system; however for the purposes of this article we have taken only the fish as the one and only load, assuming 1lbs of Oxygen per 1lb of feed fed. So please use this calculation as a guideline with discretion. 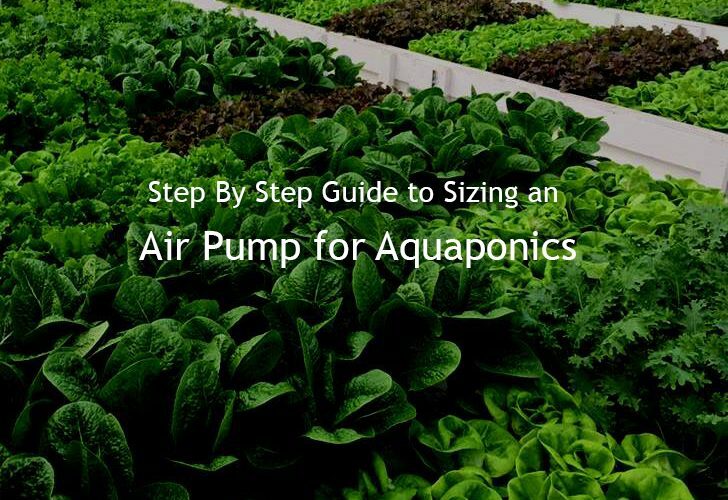 If you need more help with sizing an aeration system for your own aquaponics system or if you’re looking for a tool that can help you with almost any aspect of the design then check out the 5in1 Design Calculator which comes with 5 separate calculators that give you all the design parameters you need so you can quickly design or test your system without having to do worry about any complicated equations.